Product Condition: The Arizona Soft Footbed Limited Edition Narrow Sandal - Women's is in Like New condition. VFC- These sandals were previously owned for a month. 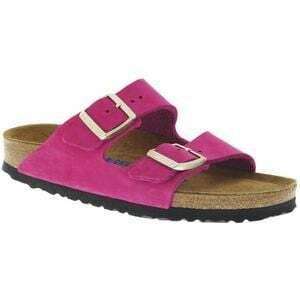 The following observations were made regarding this item: *There are no holes or rips on the sandals. *The bottom soles do not show use. Interior soles show little use from trying on once. *There is still plenty of tread on the soles * Item sold as is, all warranties void. Once you own a pair of Birks, trying to convince yourself to put anything else on your feet in the summer becomes almost impossible. Luckily, the Birkenstock Arizona Soft Footbed Limited Edition Narrow Sandal goes with just about anything besides a business suit. Pair this free-spirited classic with socks, without, with a sundress or jeans and a tee, and you'll have comfortable feet. The sandals are built on an extra-soft cork platform and an additional layer of EVA foam for added shock absorption. A deep heel cup and ample arch support stabilize your feet during late summer walks and dinners in town, and a narrow width accounts for ladies whose slender feet swim in the OG Arizonas.